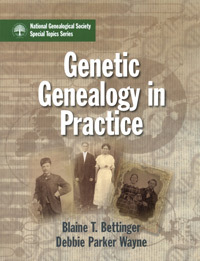 At their own pace, readers learn the basic concepts of genetic genealogy. They then build on that knowledge as they study the testing, analysis, and application of YDNA, X-DNA, mitochondrial DNA (mtDNA), and autosomal DNA (atDNA) to reach and support genealogical conclusions. Each chapter includes exercises with answer keys for hands-on practice.